Mass shootings have become America’s deadly new normal. Over a span of four days last week, three separate mass shootings in different parts of the country left 14 people dead. 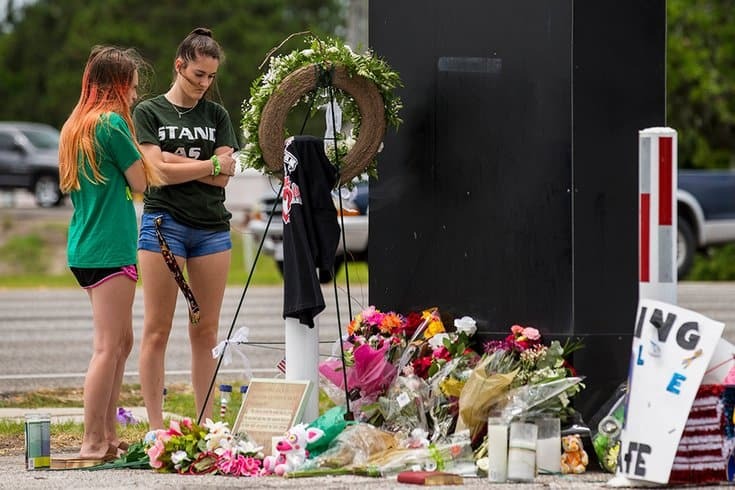 In Sebring, Florida, a 21-year-old white male entered a SunTrust Bank and executed five women with a handgun. Police found the victims face down in the bank lobby with gunshot wounds to their heads and torsos after what is so-far believed to be a random shooting. Four of the women worked at the bank and there was no one else inside at the time. The shooter killed everyone he encountered, then called to admit his crime and was arrested on the scene. Police said in a press conference that the suspect plainly stated to a dispatcher: “I have shot five people”. The gunman initially resisted leaving the bank but surrendered when SWAT team members entered to negotiate with him. A woman who identified herself as an ex reported that the shooter had spoken to her and others about fantasies of killing people and was kicked out of school after sharing a dream that he’d killed everyone in his class. She claimed that he was fascinated by death and she’d voiced concerns to other people about it, but no one took her seriously. However, she also said when the gunman told her he’d bought a new gun the week before the shooting, she didn’t think much of it since he’d always liked guns. Victims: Marisol Lopez, 55. Ana Piñon-Williams, 38. Cynthia Watson, 65. Jessica Montague. The fifth victim’s name is being withheld under state law designed to prevent location and harassment of victims and relatives. In State College, Pennsylvania — just miles from Penn State University’s main campus — a 21-year-old white male opened fire in a bar before fleeing the scene and breaking into a home where he killed the homeowner, then himself. The suspect was said to have arrived with a female believed to be a former girlfriend, and after staying for hours the two reportedly started a heated argument at the bar. A man seated nearby tried to intervene and that’s when the suspect began shooting. The man was killed instantly, his 19-year-old-son died in the hospital the next day, and the shooter’s former girlfriend was left in critical condition. The gunman fled the scene and broke into a nearby home by shooting through the sliding glass door. Unfortunately, he killed the 83-year-old man who lived there before killing himself. The man’s wife barricaded herself in a room to call 911, but it was too late to save her husband. Those who knew the suspect seem mostly surprised to learn he was behind a murderous rampage. The suspect’s uncle reported that he was good in school, stayed out of trouble, and completed three-years active duty in the U.S. Army. He described the suspect’s mother and father as supportive and “very good parents” who kept their son in extracurricular activities. Former neighbors were shocked to learn the gunman was a killer, remembering him as quiet and well-behaved. Victims: Dean Beachy, 61. Steven Beachy, 19. George McCormick, 83. Jordan Witmer (self-inflicted). Near Baton Rouge, Louisiana, a 21-year-old white male shot and killed three people he’d been living with before driving to the home of his parents and shooting both his mother and father to death. The suspect was captured when officers were waiting in his grandmother’s Virginia home when he arrived. This shooting is speculated to be a case of domestic violence. The suspect had been living with his girlfriend and her family for a matter of weeks when he was asked to leave. He then shot his girlfriend, her 17-year-old brother, and their father to death. Two children, ages 1 and 7, were in the home at the time but were able to escape unharmed. Next, the shooter stole the father’s truck and drove to his own parents’ home, where he allegedly had also been asked to leave. The gunman shot his mother and father, who were still alive and able to identify him to police before succumbing to their injuries. The suspect was arrested in Virginia, nearly 1,000 miles away from the shooting scenes. He made it to his grandmother’s house and was armed when he arrived. Court records show the shooter has a history of violence. His brief marriage ended in divorce and his wife accused him of throwing her through a window, among other things. The gunman’s relationship with his parents deteriorated to the point that his mother sought a restraining order against him, and his father testified on her behalf. The order was not granted, though the judge did order no contact between the mother and son. Victims: Billy Ernest, 43. Summer Ernest, 20. Tanner Ernest, 17 . Keith and Elizabeth Theriot, both 50.